We are preparing to launch the first part of our highly anticipated Quality of Life update! You’ve seen some of the details already in the Road Ahead at the end of January, but there’s so much more. As per usual, our Version Update will begin rolling out to all players starting this afternoon, Wednesday, 3/13. with the changes below. And in the following days, Players will be required to update, if they haven't already, players will be required to update in order access the final features for this update. We are planning to launch part 2 on 3/14 but it could shift to 3/15 depending on how the roll out goes. Check out the bottom section for what changes will occur in round 2 of the update. Now, on to today’s changes! Revamped Description Pop-Up: Along with the Buff UI overhaul, you can now long-press a character to toggle a revised pop-up, showing the names and descriptions of all buffs / debuffs on the character. This pop-up works for both friendly and enemy characters / ships in combat. 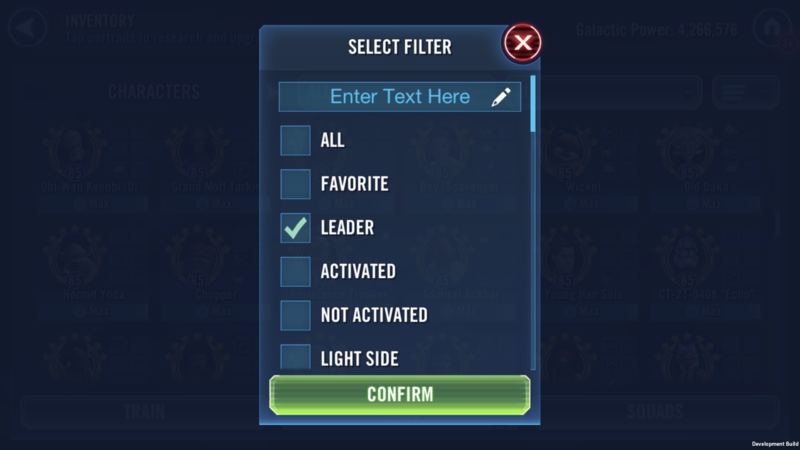 Unique Only Toggle for Saved Squads / Mod Loadouts: Now, as you are juggling multiple squads and mod sets for Grand Arena, Territory Wars, and other game modes, we’ve added a “Unique Only” option for you to highlight all duplicate characters in squads, or all mods already set to a current loadout tab. This will help you avoid committing a character to a squad (or a mod to a loadout) that you’d like to save for later. Better Gear Find Flow: Gear find flow has been improved to search for both full pieces and salvage / components. The Connect sub-menu (on Android) now holds the Connect to Facebook, Sign In/Out of Google Play, and Link a Device options. Power up the characters needed in the Scourge of the Old Republic event with this Event Pack! Each pack awards 1 card of character shards worth 10-330 shards. Unlock or power up the duo of Carth Onasi and Canderous Ordo with this special bundle! BONUS: This bundle also includes CRYSTALS, Credits, training droids, ability materials, and gear to immediately power up Carth Onasi and Canderous Ordo. Unlock or power up the duo of Bastila Shan (Fallen) and Juhani with this special bundle! BONUS: This bundle also includes CRYSTALS, Credits, training droids, ability materials, and gear to immediately power up Bastila Shan (Fallen) and Juhani. The Heroes of Legend Bundle for HK‌-47 is now in the Store for a limited time! Power up the infamous Assassin Droid with this bundle and eliminate your meatbag enemies! Savage Opress AI will use his level 8 Omega "Overpower" Special ability properly when the target is below 50% Health. Mods Management scrollbar now remembers the last position it was at after using the back button. Fixed an issue where loading into Grand Arena for the first time while it is active would sometimes show the player portrait incorrectly. Fixed an issue with "letterboxing" on iOS devices with 1.43:1 aspect ratio. Fixed an issue with chat windows becoming stuck on screen while auto battle is enabled in a Raid. Fixed an issue with extraneous text appearing on screen in the daily login window after changing timezones during a month rollover to the next month. Fixed an issue where GP was not updating immediately in the status menu after slicing a Mod. Fixed an issue with buff/debuff details pop-up remaining on screen during raid phase transitions. Fixed an issue with reward icons appearing missing after simming multiple battles. Fixed an issue with Death Trooper's rifle SFX being used by other units in the same battle. These changes require all clients use the same updated version and will not be active until players are required to update if they haven’t already. Raid Simming: Veteran Guilds can now sim the Heroic Raid, The Pit! Simming a Raid automatically delivers identical rewards to everyone in the guild. 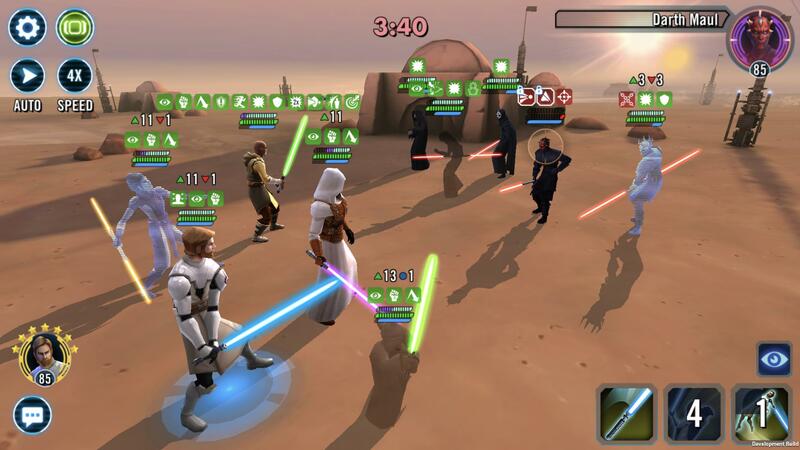 Guilds must have completed the Heroic Rancor 50 times, and there must be at least 35 players with a 7* Han Solo in the guild at the time of battle start in order to sim. 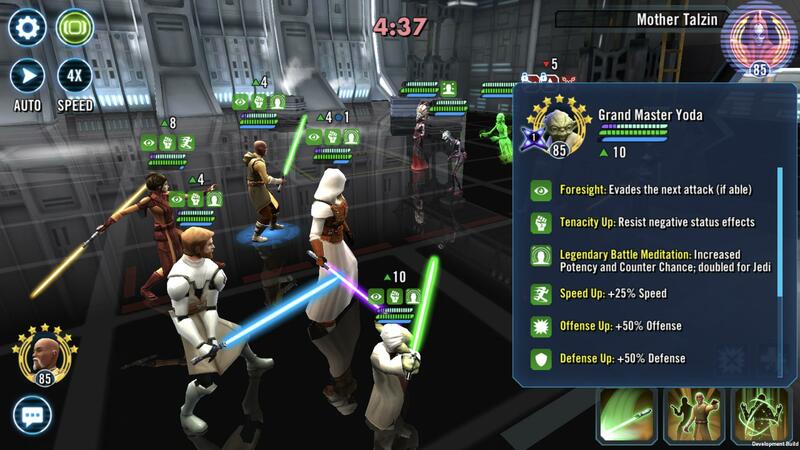 Grand Arena Auto-Deploy: If you forget to set your roster after signing up for Grand Arena, or if this is your strategy (shame on you), but if you do forget to set defenses we have a new feature that will distribute your strongest characters from highest to lowest power to your defensive teams. This isn’t a substitute for placing teams yourself as Auto-Deploy doesn’t take into consideration any team composition or synergies. I’m not receiving any progress towards my raid quests any more, why not? Simmed Raids don't count towards quests. You’ll need to beat the raid manually in order to get credit for quests. How long do I have to join a raid once we choose to sim a raid? A simmed Raid’s default auto-launch join period is 1 day. This can be modified by the Leader or Officer launching the raid. Quick read through and looks like a solid QOL update. Ty. What are the rewards for a simmed raid, besides "identical"? First place? Top 10? Top 20? Last? Why the heck does simming raids still require people to join? If you can sim a raid, everyone should be automatically joined to it. Other than that, some solid improvements. And why do we have to join a simmed raid? A simmed Raid’s default auto-launch join period is 1 hour. This can be modified by the Leader or Officer launching the raid. Why not just send everyone rewards when it "sims" it? This seems silly. Query : Can we know the quality of the Pit Raid? Is this equivalent to rank 1? 10? 30? I would also like more details on raid simming. One of the FAQ is about the "join period" for the raid, but the description says that it delivers identical rewards to all guild members. So...do players still have to join? Or can it be set so that as soon as we get the correct number of tickets, the raid sims and everyone gets rewards? I'm confused. 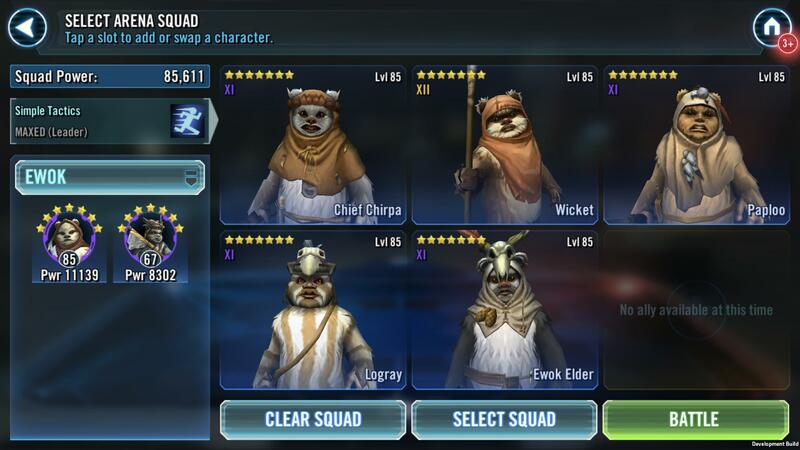 While it's nice that you'll be able to tell your Jawas apart once you've set up the squad, but where you need to be able to identify them better is when you are selecting the characters from the list on the left hand side. How dare you force me to auto deploy a defense in your terrible GA mode! Also why do you have to join a simmable raid? That is just idi otic! @CG_SBCrumb - Any details you can provide on what the simmed rewards structure looks like? It's an awesome addition, just hoping that the reward leveling is 'decent'. Thanks. So, does this mean that if I don't set a defense for second/third round of GA, it'll randomly autodeploy instead of deploying similar to first round? No word on the 2018 iPad Pros. Why would I do that? It's free rewards! How dare you join a GA if you aren't going to set defenses. You ruin it for someone else who actually enjoys it, and you rob them of any possibility of credits from hitting your defensive squads. Shame on you. Then why do you care that it auto-deploys a defense? You want to benefit from something without participating in it? Shocking. Because then I can't prevent them from getting credits from attacks or progress towards their prestige quests. Well, if it makes things any better for you, fighting some random, non-synergistic squads will probably be just annoying, as opposed to fighting squads that make sense. Great improvements. Looking forward to raid simming. 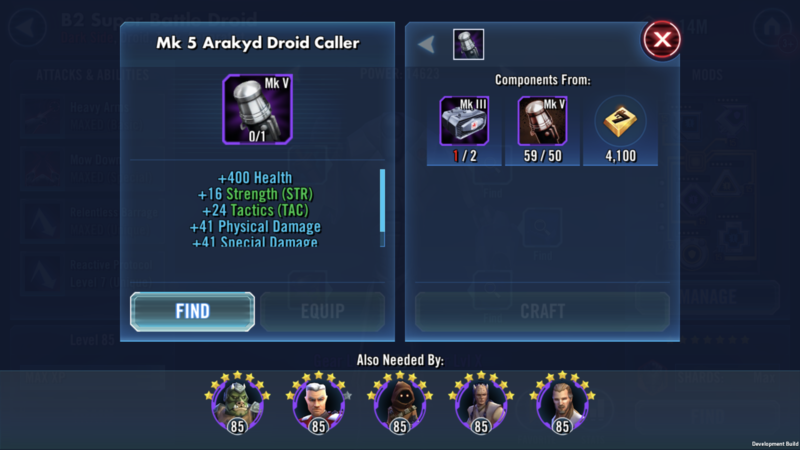 Those toon packs for Darth Revan are great huh. Mixed the two toons that most probably have 7* with the two least likely to not be 7*. Why wouldn't they have this? It's actually a really good deal, and is exactly what they did last time. What cadence would change? "You know, instead of just instantly giving everyone currently in the guild the same rewards, let's still give the raid an actual launch and sign up period. Better yet, let's make the DEFAULT a ONE HOUR sign up period. I mean what could possibly go wrong? Also, when we tell everyone about this, let's keep the rewards a complete secret too. Build the intrigue on our oldest, easiest content!!" With my guild right now, we have a lottery to have a single person slay the rancor. 24 hour sign up because we have people from all over the world in our guild. Literally takes 5 to 8 minutes for them to battle and another hour for everyone to get the rewards. Raid simming then is saving very very little time. It seems like a lot of effort to introduce a feature to veteran guilds that already have a system in place that essentially requires the same amount of effort. I'm sorry I love this game and the other changes but there are moments like this that just blow my mind. I'm sure SOMEONE had to have mentioned to the development team "Hey, why not just auto join everyone in the guild." There had to have been a discussion. At the very least could you share why this wasn't a possibility or why you still require a join period?